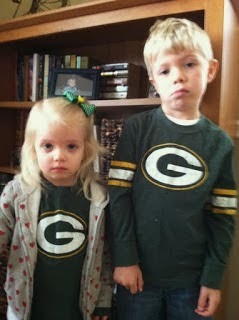 My little Packer fans spent yet another Super Bowl Sunday protesting Green Bay's absence from the big game. Hallie has never had any trouble flashing a turned-down mouth and furrowed brow, but Will struggles with each round of Grumpy Packer Backer photos. Angry faces just don't come as naturally to him as they do to her. The emotion in the first picture of this series - see below - was captured accidentally. On Super Bowl Sunday I brought out all of the kids' Green Bay gear for one more wear. As Will pulled on his Packer shirt, he asked excitedly if the Packers had made it to the Super Bowl. When I explained that no, the Packers weren't playing that day, the authentically forlorn expression you see above passed slowly across his face. Hallie, on the other hand, just didn't feel like smiling for the camera. This tradition of Will and Hallie wearing their disappointment on both their faces and torsos began in 2012 will continue as long as is necessary…hopefully 2020 will see our Green Bay Packers rise to the top once more. with a unilaterally flared nostril - is worth sharing as well.